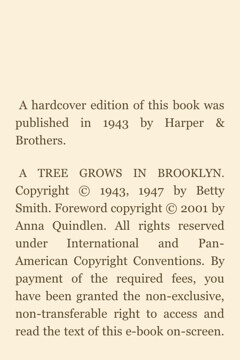 I have the Kindle version of “A Tree Grows in Brooklyn” and I’ve had some difficulty trying to figure out how to cite it… I’ve looked all over the internet but I can’t seem to find one solid way of citing it. I was wondering if you had any suggestions because I’m pretty lost on this one. I happen to have the same edition. As it happens, this edition has a section called “Credits” in the table of contents. Below are screen grabs, showing how those pages look on the Kindle app for my iPod Touch. That’s a great question. In the “Credits” section we see that this book was originally published in 1943, and the “Microsoft Reader” version was published in Dec 2003. The Kindle didn’t exist back then, and according to Google, “Microsoft Reader” is a free Microsoft tool designed to encourage people to read books on Microsoft devices. 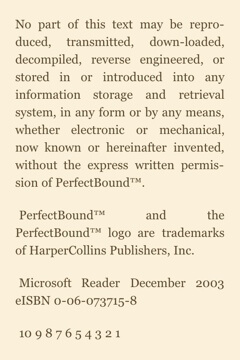 But this publisher has obviously re-released this e-book for the Kindle. Smith, Betty. A Tree Grows in Brooklyn. 1943. New York: HarperCollins Publishers, Inc. 2003. Electronic book. I also teach new media theory and culture classes, where we might spend considerable time examining, for instance, the differences between reading an e-book on a physical Kindle, and the Kindle App for iPad. Some digital historians I know would say that it does, indeed, matter whether you read your text on the Microsoft Reader (as the publisher initially intended), or whether you read it on an iPad app. Authors may use blank pages, white space, line lengths, typefaces, insets, color plates, and footnotes to specific effect; an ebook version may not include all these details. So it would make sense to let people know whether you are reading a copy of Alice in Wonderland on a device that shows no illustrations, or black-and-white illustrations, or greyscale illustrations, or color illustrations. Further, the software that Kindle creates may change over time. Perhaps a future edition of Emily Dickinson’s poems will come with an option that lets the reader choose whether to start each poem on a new page, or switch back and forth between an image of the printed page, and a flowing stream of text formatted for the screen (Google publishes an app that does that). Therefore, for an advanced class where the medium of publication is an important part of the focus, it seems we should add some more details about the specific experience we are studying — reading a particular text, on a particular piece of hardware, running a particular piece of software, at a particular time. Looking in the “About” sections of my iPod “Settings” app, and clicking the “i” button on my Kindle App led me to “About” pages that identify what version of the operating system and the ebook reader that I’m using. Smith, Betty. A Tree Grows in Brooklyn. 1943. New York: HarperCollins Publishers, Inc. 2003. Kindle for iPhone version 2.6. iPod Touch 4. iOS 4.3. Electronic book. 14 March, 2011. Rather than add page numbers that don’t correspond to print books, which is how page numbers have been added to e-books in the past, we’re adding real page numbers that correspond directly to a book’s print edition. We’ve already added real page numbers to tens of thousands of Kindle books, including the top 100 bestselling books in the Kindle Store that have matching print editions and thousands more of the most popular books. As you can see, they are rolling out this change starting with their top sellers; if any of my Kindle books have added “real page numbers,” I haven’t noticed. You should always check with your individual professor; he or she may ask that you look up the passages in a print copy, to be sure that your pages match up with the professor’s edition (so your prof will be able to follow your argument closely). As long as I have a copy of the digital text, I can search for whatever passage the student is quoting, and follow along that way. 14 Mar 2011 in Academia, Books, Cyberculture, Literature, Media, Technology. None of this is any help for students needing format for in-text citations. I’m not sure how to take your comment, Kristina. My blog clearly explains that some Kindle books will be enhanced with “real page numbers,” but of course we consumers have little to no control over what Kindle does. My copy of The Hunger Games features actual page numbers, alongside the Kindle “locations.” But my free, out-of-copyright edition of This Side of Paradise does not. Since there is no standard, universally accepted solution, you should ask your instructor. I have no idea what he or she will say. If you are the instructor, how would you suggest I improve my response? This was most helpful, but the ebook I got is a “boot-leg” copy; namely, there is no real publisher for it because I got it from a website dedicated to giving free PDF downloadable files of the book. Is there any way to cite that, or must I find a print copy of my book to cite? Some of you people are just rude. Thus far e-books are relatively new; therefore, citing such electronic sources is a gray area. Mr. Jerz was simply trying to help. If you are unsatisfied with what is here, then search somewhere else.